Located a short walk from Russell Offices, this generously sized, ground floor studio apartment is fitted out with everything you need for work and relaxation. Take advantage of the free unlimited ADSL2+ wifi to catch up on work, or relax at the end of the day while watching the large flat screen Smart TV. If you have your own Netflix or Foxtel On The Go subscription – just log in on arrival and pay no extra subscription fees! 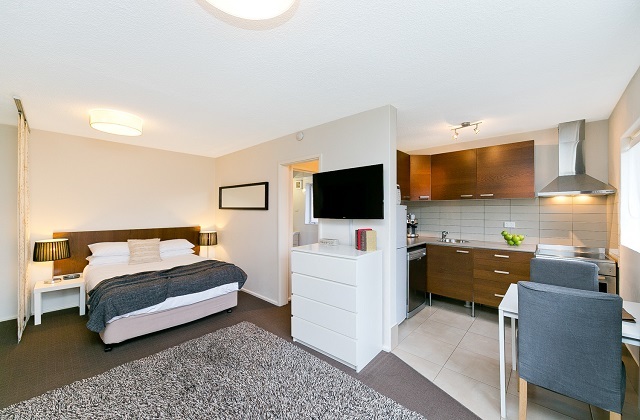 Furnished and presented in a contemporary style, the studio also features ample storage space, including a walk-through wardrobe which leads into the ensuite-style bathroom. The gorgeous Ikea kitchen is complete with full-sized oven, microwave, dishwasher and espresso machine. With off-street parking and a shared laundry located in the grounds of the complex, and the Campbell shops are just across the road, the studio is ideal for Defence or Public Service personnel on short–to-mid-term contracts in Canberra. Click here to check availability and book now.